Stream anime episodes for free, you want to Watch Fairy Tail Episode 50 English Subbed online for free. Episode guide Fairy Tail Episode 50 English Subbed Special Request: Watch Out for the Guy You Like! 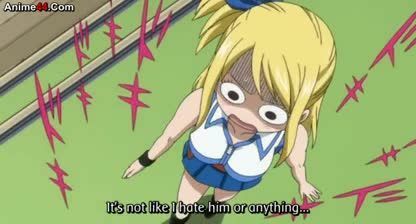 Love is in the air as Lucy thinks that Natsu has secret feelings for her. Meanwhile the whole Fairy Tail guild is turned upside down because Juvia whom believes that her relationship is going no where employs magical help from a love potion which in fact turns out to be a potion which makes the person who drinks it think that the first thing they see is their rival; Juvia attempts to use in on Gray but misses multiple times making everyone in the guild have rivals.